Foursquare is mayor of New York's mindshare and Pandora's Tim Westergren looks awfully familiar. Bjorking Your Bachelor Party As a sign of just how many bachelor parties an up-and-coming venture bro is obligated to attend, during a recent PandoMonthly panel, Thrillist Ben Lerer said if he had to pick a totally ordinary superpower, it would be making sure his wife was cool with him going to bachelor parties. (To be fair, it took him a long time to come up with it, so it might not be that high on his list.) Hopefully his better half was understanding about a recent trip Mr. Lerer took to Iceland celebrate the end of singledom for Spark Capital’s Mo Koyfman. The recently promoted general partner invited a number of other techies for the festivities, including Eater.com cofounder Ben Leventhal and what looks an awful lot like Jakob Lodwick and Ricky Van Veen, who Mr. Koyfman would know from his days as an IAC executive “adult supervising” College Humor. Definitely present? Author and MSNBC cohost Touré! Mr. Koyfman tested hashtags for Instagramming his international excursion, trying out #koyfops before settling on #icemomo, although NYC yoga instructor Heather Lilleston also suggested #mochella. Mr. Koyfman is engaged to Hilary Rosenman, CEO and founder at the shoe line Madison Harding. Ms. Rosenman is a graduate of the Upper East Side’s prestigious Nightingale School, where she went with fellow fashion designer Charlotte Ronson. Her entrepreneurial exploits have been documented by no less than investor Joanne Wilson, better known as Gotham Gal. Wait, when did this become the Vows section? We can only hope that they weren’t there to make friends. Cultural Literacy Speaking of Startups: Silicon Valley, sounds like not every citizen of techlandia plans on boycotting and/or furiously protesting the controversial new show. Earlier this week, Google director of project management Hunter Walk confessed that he’s “Been invited to 2x more viewing parties for Bravo’s Silicon Valley show than for presidential debates.” Dire portent of America’s decline, or revealing statement regarding startup self-involvement? Only the wild-eyed witches of the Real Housewives franchise are qualified to answer, and they’re not talking. Turns out we had seen him in the deliciously trashy teen drama Gossip Girl–well, kind of. 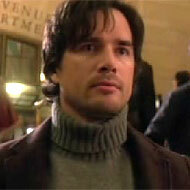 Mr. Westergren looks remarkably similar to Rufus Humphrey, father to Jenny and Dan Humphrey and portrayed by Matthew Settle on the scandalous show. The last time we spotted Mr. Settle in Startupland was with Brew PR cofounder Brooke Hammerling at the Gizmodo “First Comes the Dream” event. If that whole Pandora thing doesn’t quite pan out, we suppose Mr. Westergren can always play a Rufus Humphrey stand-in. As Ms. McCarthy points out, context is implicitly assumed to be unnecessary. And we must say, as insider-y local advertising goes, it’s far more charming than the tired, am-I-right politicking of Manhattan Mini Storage. Hey, there are probably worse ways to get an abandoned item of clothing back.